Polymeric droppers packed in cartons (by 1-4 pcs) with package insert. 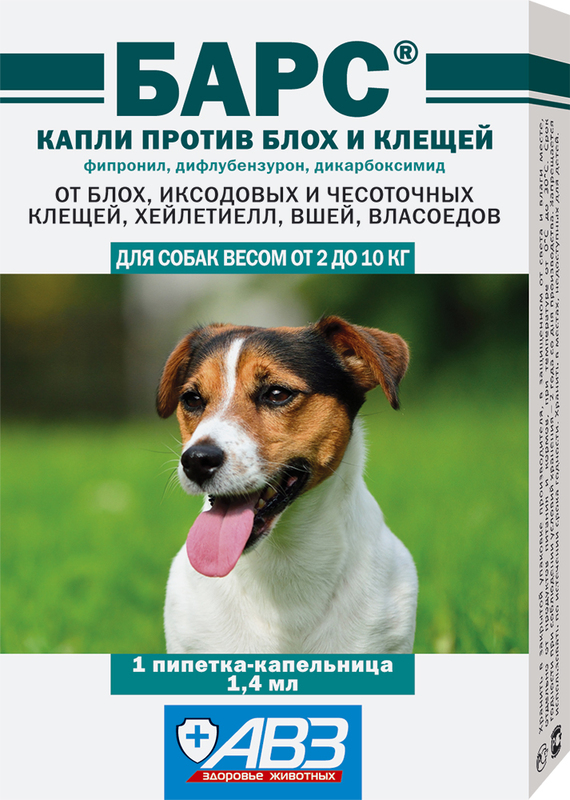 Innovative, least toxic but highly effective medication against fleas and ticks in dogs and cats. You can choose and purchase the required product quantity depending on your pet weight. Three components of the drug have synergic effects, which (considering the relatively low concentration) provides the highest possible efficiency. BARS® drops against fleas and ticks for cats contain fipronil - 10 mg/ml, diflubenzuron - 1 mg/ml and dicarboximide (MGK 264) - 1 mg/ml (as active ingredients), as well as excipients. BARS® drops against fleas and ticks for dogs contain fipronil - 50 mg/ml, diflubenzuron - 1 mg/ml and dicarboximide (MGK 264) - 5 mg/ml (as active ingredients), as well as excipients. The mechanism of fipronil action (a component of the drug) includes blocking the GABA-dependent receptors of ectoparasites, which impairs the neural impulse transmission causing paralysis and death of ectoparasites. Diflubenzuron, by means of inhibiting the chitine synthesis in parasites, impairs of molting, egg production, and egg hatchability processes terminating the population growth and sustaining. Dicarboximide acts as a synergic drug and is commonly combined with insecticides to increase its efficiency. Dicarboximide prevents microsomal detoxification of insecticides increasing its toxicity for parasites. After dermal drug application active ingredients do not absorb into systemic blood equally distributing along the body surface with further accumulation within sebaceous glands providing long-term protection from ectoparasites. Bars drops against fleas and ticks are related to moderately hazardous substances. The drug does not have resorptive toxic, local irritative and sensitizing effect when administered in recommended doses; induces irritation in case of contact with eyes. The drug is well-tolerated by dogs and cats of various breeds and age. On the other hand, it is toxic for rabbits, as well as for fish and other aquatic organisms. Increased individual sensitivity to the drug components. Do not use in contagious, weakened and recovering animals, pregnant and lactating females, as well as in puppies and kittens under 8 weeks old and dogs weighting less than 2 kg. 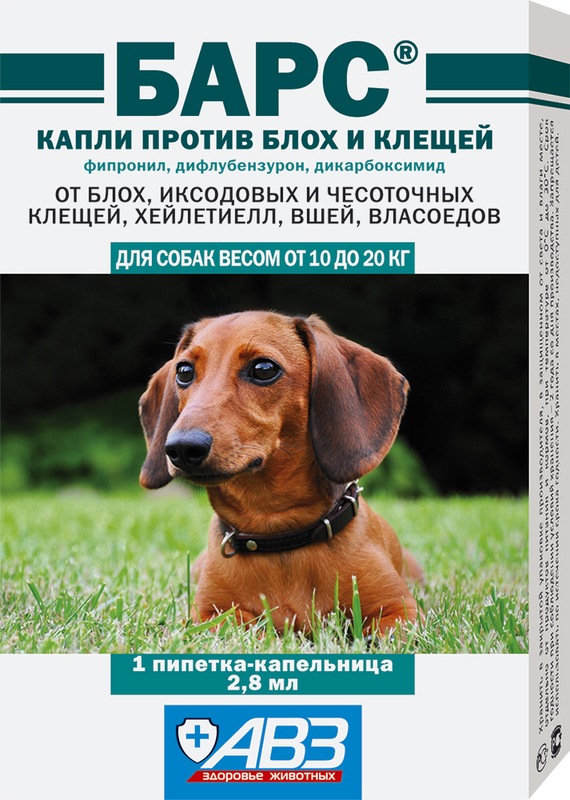 Do not use BARS® drops against fleas and ticks auricularly in case of tympanic membrane perforation. 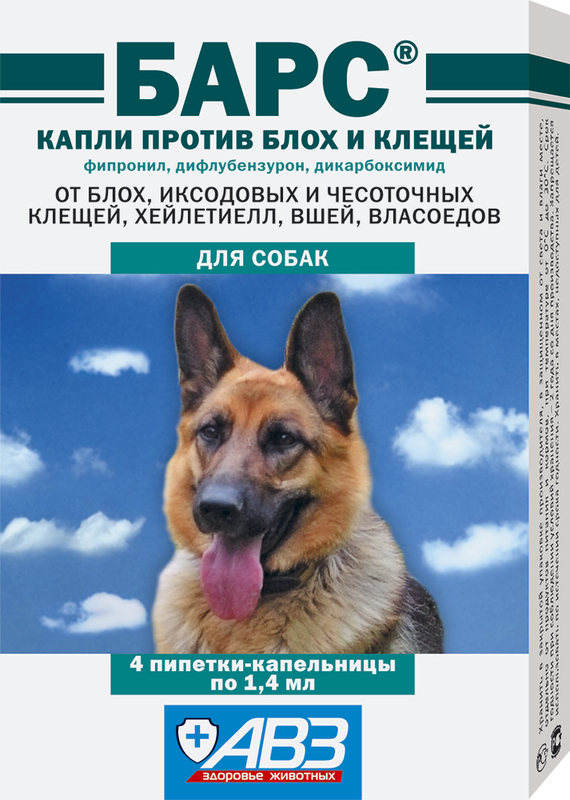 Administered in a single listed dose by spot-on application on dry intact skin in several points in the region of back (between scapulae) or neck (near the skull base) (out of the reach of licking). 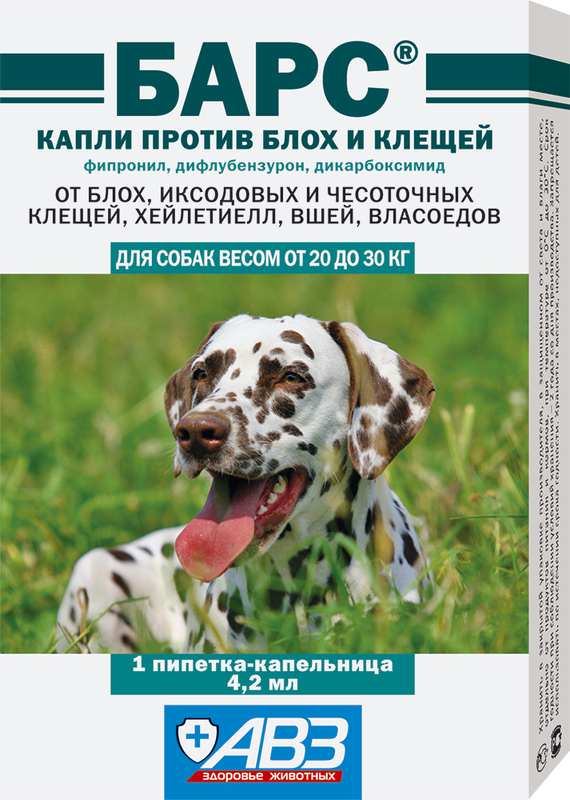 Large dogs (≥30 kg): 0.1 ml/kg combining droppers of different volume. Protective effect lasts within 1-2 months. Reprocessing: according to indications, no more than once a month. Treatment of otoacariasis: previously clean conches and acoustic meatus from ear wax, exudate and sloughs, then instill 4-6 drops in each ear. Middle animal conch and slightly massage its base for equal drug distribution. Apply the drug remain in dropper between scapulae. Neglected case of otoacariasis complicated by otitis: administer antibacterial and anti-inflammatory drugs and in 7-10 days repeat auricular administration of BARS® drops against fleas and ticks. Instill the drug in both ears, even where the only one is affected by otoacariasis. Gently fix animal's head within several minutes to prevent drug splashing (if an animal shakes its head). Prevention of flea reinfestation: change beddings or process them and floors in premises by any insecticide agent according to package inserts. Do not wash and bathe an animal within 3 days before and after processing. Do not to apply the drug on wet or damaged skin. Adverse events and complications are generally not observed in case of administration as per package insert. In case of increased individual sensitivity to the drug active ingredients or overdose, wash it away with water and washing agent, administer antihistaminic and symptomatic drugs. Store in closed original package. Protect from light and moisture. 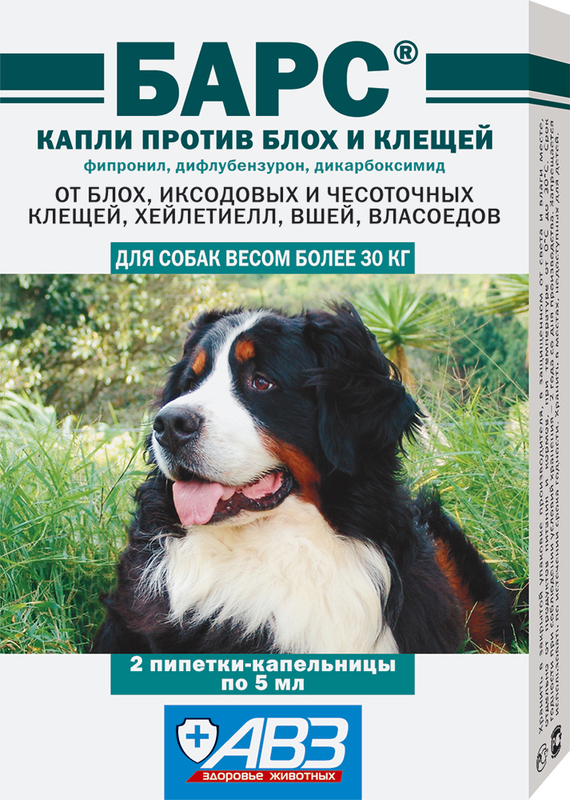 Store separately from food and animal feeding at 0-30°С. Keep Bars insecticidal acaricidal drops out of the reach of children. Drug shelf life is 2 years from manufacturing date when stored in accordance with regulations. Recover unused expired drug with household wastes.